The 7TP was the best Polish tank in the 1939 campaign, and one of the symbols of the pre-war Polish Army. The ultimate and most numerous variant was the single-turret version, with 37 mm Bofors gun. You can read more about its development and combat use on my page. First to Fight's kit of the single-turret 7TP appeared in 2015. It should be noted that this kit represents the less numerous early production single-turret tank, differing from the main series in a low-mounted muffler and horizontal shutters in the rear plate instead of armoured doors. (It shared the hull with the initial twin-turret version.) Such decision is justified by the desire of parts' unification with a twin-turret model, but the result is a relatively rare version (probably no more, than 18 tanks). Of course, the difference is negligible, if you need just a generic single-turret 7TP. The kit contains two sprues, with 21 parts. A basic small assembly instruction is given on the back side of the box, which is sufficient. 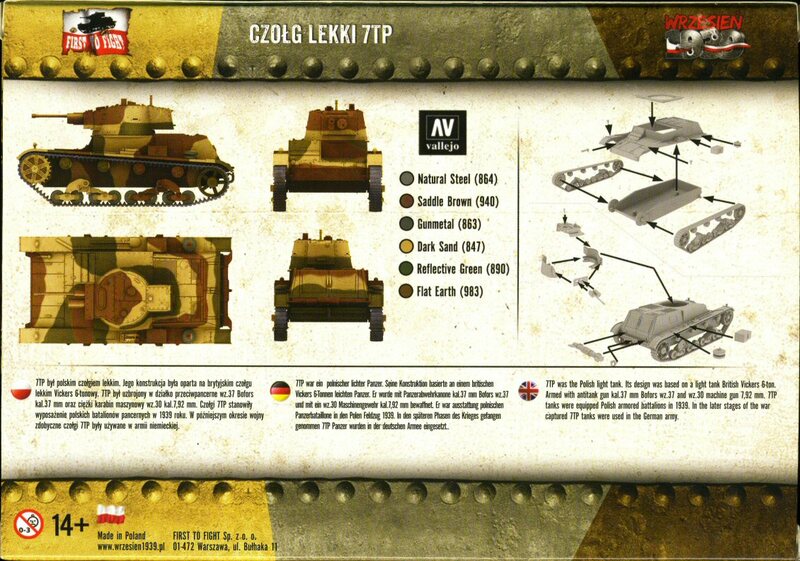 It also comes with a thin booklet on the 7TP and the Polish Campaign, which is in Polish only. (Actually the kit is a "bonus" to the periodical booklet.) On the box you'll find a painting scheme with the corresponding Vallejo paint call outs, also repeated in the booklet. The model is a quick build kit, but all the parts are very sharp and highly detailed. Tools are finely moulded on the fenders. Separate external parts are only given for the following: two headlamps, a horn, two toolboxes, two spare wheels, a muffler, a towing hook and an antenna base. (The model on the photos has no antenna base attached to the turret - only commander's tanks were fitted with radio.) On my sample there were no sinkholes or flash in visible places. All the ejector marks are on the inside of the parts and not in visible places. Overall the moulding quality is very good and details are delicate; bolts and division lines between armour plates are subtle. Naturally, for a quick build kit, handles on the hatches are only marked (but at least they are not oversized, as in the Mirage 7TP kit). The plastic is rather soft and easy to work with. However, there will be cutting nubs, which should be sanded out and painted. Due to the producer's technology, attachment points are quite thick. This is especially visible on small or rounded details (like the headlamps or the gun barrel), which need to be carefully cut-off, profiled and cleaned. As for a technological division, it can be disappointing that the gun's mantlet is not made as one separate part, and cannot elevate. Moreover, elements of the mantlet are on three turret parts, and it needs care to fit them all to the front plate without cracks. (To tell the truth, my provisionally assembled model features cracks...) It also concerns other turret parts. There are no bottom surfaces under the mantlet and the rear niche, so you must scratchbuild them if you need to make the bottom of the turret visible. (It seems that FtF could have easily done them, but they didn't). • Height: 2273 mm / calculated 31.5 mm / model 31 mm. Since this is a quick build kit, the main area of simplification is the suspension, which is all cast in one piece along with the tracks, for each side. Sadly, all roadwheels, support wheels, idler wheels and sprocket wheels are made thicker instead of being double. It disqualifies the kit from being a serious contest model, but such a solution is enough for dioramas, especially as the difference is not striking. The tracks have a nice central sprocket teeth, but their outer surface is barely acceptable - a complicated waffle pattern was reduced to simple bars, but this can be justified by the small scale. (The tracks are only 4 mm wide, what corresponds to an original width of 268 mm.) Also, a lot of attachment points are on the outside of the tracks. The designers put a big effort to render details on the sides of the suspension sets, including bolts on the rocker arms, but something that can raise small doubts, is the shape of the cast-steel rocker arms. In the model they have flattened sides, leading to a rather angular upper edge, while on the photos they give a more rounded impression. The difference is subtle, however. Unfortunately, compared to the detailed upper surfaces, the hull sides (which are moulded as one part with a bottom) are flat and lack any details, like division lines and bolts. Only the rear slanted side plates are detailed, but the chosen technology led to a simplified rendering of the upper edge of the small hatches in these plates. The rear plate has nicely rendered horizontal shutters of the early version. The turret is nicely rendered on all sides, including bolts and distinct vision slots. There is, however, not any detail on the tank's bottom. Apart from these simplifications, the only omission in the kit is the lack of four fender supports on each side, and a small mast (wire cutter?) next to the driver's hatch. For a quick build, this kit is of high quality and moulded to a high standard. It is recommended for wargamers due to its simplicity and low cost, but also for modellers, due to the high level of surface detail and overall quality. 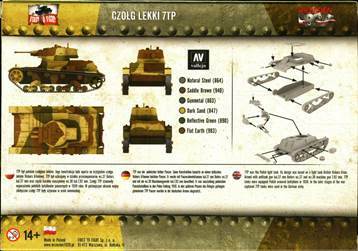 While simplified tracks and suspension make it inappropriate in the role of a showcase model, it is a great addition to a Polish campaign diorama, where its simplifications won't be noticed.